Objectives: To evaluate the validity and compare the performance of cancer antigen-125 (CA-125), human epididymis protein 4 (HE4), the risk of malignancy index (RMI), and the risk of ovarian malignancy algorithm (ROMA) in the diagnosis of ovarian cancer in patients with ovarian lesions discovered during their preoperative work-up investigations. 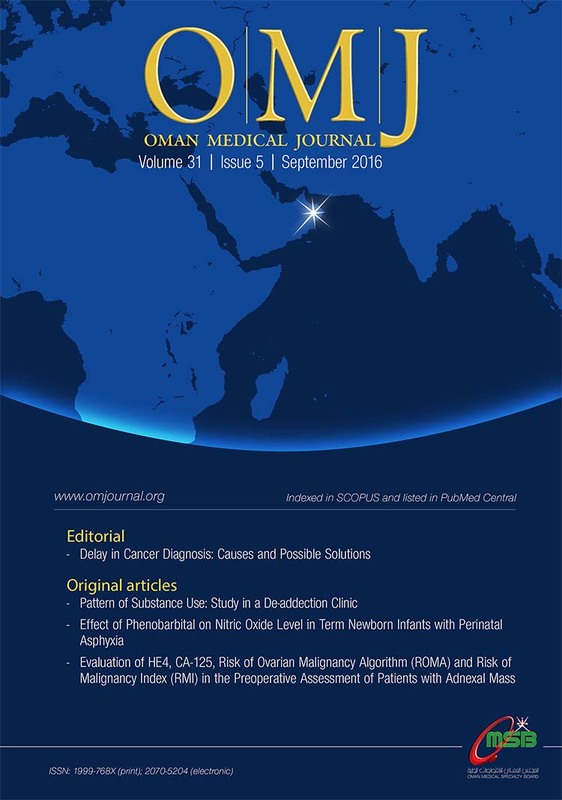 Methods: This prospective, cross-sectional study looked at patients who attended the gynecology department at the Royal Hospital, Muscat, from 1 March 2014 to 30 April 2015, for the evaluation of an ovarian lesion. The inclusion criteria included women who underwent surgical intervention and who had a preoperative pelvic ultrasound with laboratory investigation for CA-125 and HE4. The study validated the diagnostic performance of CA-125, RMI, HE4, and ROMA using histopathological diagnosis as the gold standard. Results: The study population had a total of 213 cases of various types of benign (77%) and malignant (23%) ovarian tumors. CA-125 showed the highest sensitivity (79%) when looking at the total patient population. When divided by age, the sensitivity was 67% in premenopausal women. In postmenopausal women, CA-125 had lower sensitivity (89%) compared to RMI, HE4, and ROMA (93% each). A high specificity of 90% was found for HE4 in the total patient population, 93% in premenopausal women and 75% in postmenopausal women. CA-125 had the highest specificity (79%) in postmenopausal women. Both CA-125 and RMI were frequently elevated in benign gynecological conditions particularly in endometriosis when compared to HE4 and ROMA. We also studied modifications of the optimal cut-offs for the four parameters. Both CA-125 and RMI showed a significant increase in their specificity if the cut-off was increased to ≥ 60 U/mL for CA-125 and to ≥ 250 for RMI. For HE4, we noted an improvement in its specificity in postmenopausal women when its cut-off was increased to140 pmol/L. Conclusions: HE4 and ROMA showed a very high specificity, but were less sensitive than CA-125 and RMI in premenopausal women. However, they were of comparable sensitivity in postmenopausal women and were valuable in distinguishing benign ovarian tumors or endometriosis from ovarian cancer. Modifying the cut-off values of the different markers resulted in a higher accuracy compared to the standard cut-offs, but at the expense of reduced sensitivity. Objectives: We sought to conduct a detailed study on the risk factors of gestational diabetes mellitus (GDM) in Omani women to determine the actual and applicable risk factors and glucose profile in this population. Methods: We conducted a cross-sectional case-control study using pregnant women diagnosed with GDM. Pregnant women without GDM were used as a control group. We collected information related to age, family history, prior history of pregnancy complications, age of marriage, age of first pregnancy, fasting glucose level, and oral glucose tolerance test (OGTT) results from three hospitals in Oman through face-to-face interviews and hospital records. Results: The median age of women with GDM was 33 years old (p < 0.050). A significant risk was noted in women with a history of diabetes (p < 0.001), and those with mothers’ with a history of GDM. A significant (p < 0.010) relationship with a likelihood ratio of 43.9 was observed between the incidence of GDM in women with five or six pregnancies, a history of > 3 deliveries, height < 155 cm, and pregnancy or marriage at age < 18 years (p < 0.010). The mean difference in random plasma glucose, one-hour OGTT, and two-hour OGTT was significantly higher in GDM cases compared to control. Conclusions: Glucose profile, family history, anthropometric profile, and age of first pregnancy and marriage should be considered while screening for GDM and determining the care needs of Omani women with GDM. Patients with anterior neck masses commonly present to otorhinolaryngology clinics, but there are limited differential diagnoses for such lesions. Common ones include thyroid nodule and thyroglossal duct cyst. In an elderly patient, a differentiated thyroid carcinoma should be suspected especially if it moves with swallowing. We encountered a typical presentation of a solitary thyroid nodule-like mass with the exception of pulsation in a 65-year-old female. Further investigation, using neck ultrasonography, revealed that it was a variant of right common carotid artery arising from the left common carotid artery. Knowledge of such variants is of great importance as ignorance of such a variation may lead to inadvertent surgical complications during procedures.